Get Ready To Fall Head Over Heels In Love! Gucci S/S 2012 Milan in Pictures! If you know me, you'd know that I am in love with black and gold. I love black and gold and I am almost always in this color combination especially on nights out. So you can only imagine the way my heart started pounding against my chest when I caught a glimpse of Gucci's Spring Summer 2012 show in Milan. 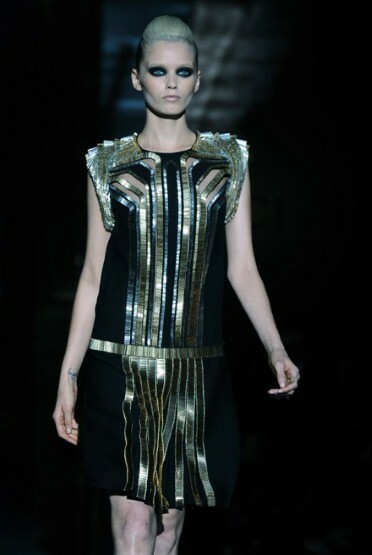 The entire show is dominated by phenomenal pieces in black and gold with a smattering of bold colors in between. By far, my favorite collection for the season. i've loved Gucci even from before the Tom Ford days!!! I really love this collection, so chic! Come and visit my blog, and if you like it, follow me, I'll be waiting for you! P.S. Thanks for the comment on my NYX post and thanks for telling me about the giveaway. abbey look so fierce on the runway. wow i love all ! Great ! We follow each other ?